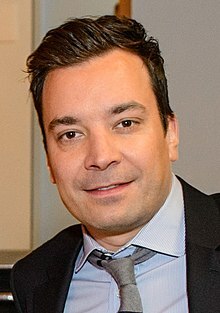 James Thomas "Jimmy" Fallon, Jr. (born September 19, 1974) is an American comedian, actor, and musician known for his work on Saturday Night Live. 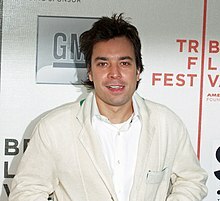 He replaced Conan O'Brien as host of NBC's Late Night with Jimmy Fallon on March 2, 2009, and replaced Jay Leno when he became host of w:The Tonight Show Starring Jimmy Fallon in February of 2014. Actually, it's tough, because he's not really screwing up. He seems to be doing a good job, but we're there just in case — the first time he does anything. Honestly, it's the greatest show on television. It's live. It's topical. It makes you laugh. It's just a great vibe. The economy is so bad, Pat Sajak had to take out a home loan just to buy a vowel! The economy is so bad, the Obamas just listed Abraham Lincoln's bedroom on AirBnB! The economy is so bad, instead of paying for heat, people are huddling around exploding Samsung phones just for the warmth!